In a stunning turn of events, murdered Russian opposition journalist and author Arkady Babchenko is alive and well in Kiev. On the most basic level, this is unequivocally good news. Babchenko, who was reported assassinated just yesterday (May 29) outside of his Kiev apartment, was actually working with Ukrainian security services to expose Russian agents who were allegedly involved in a months-long plot to kill him. The operation was so secret that even Babchenko’s wife was led to believe that her husband had been murdered. Babchenko is not the only one to get a reprieve; according to the head of Ukraine’s secret service, the would-be assassin was planing to kill 30 people on Ukrainian soil. And yet I’m left with a sense of unease that, so far, seems reflected in my social media feed. But why? Not because I would prefer him dead, certainly. Or that there is a lost opportunity for some sort of productive martyrdom. The opposition has no shortage of martyrs, and it hasn’t gotten them anywhere yet. Part of it is is simple psychology: nobody likes to be tricked. In my own case, I’m immediately reminded of a similar fraud my friends and I endured in our teenage years, although back then the motivations were emotional rather than political. But it’s not as if I knew (know?) Babchenko personally. Yet I’m left feeling manipulated, and even weirdly envious: unlike the rest of us, Babchenko actually gets to see the outpourings of posthumous admiration by friends and strangers throughout the world. He can satisfy the narcissistic wish to know what people are going to say about us after we’re gone. Some suggest that the staging of his murder will only further undermine public confidence in the possibility that the news media might be capable of telling the truth. 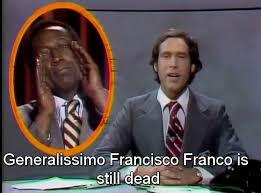 Now, even someone’s death can be dismissed as “fake news.” In 1975, Saturday Night Live had a running joke on Weekend Update after the death of Spain’s fascist leader, Francisco Franco, following a long illness: “Generalisimo Francisco Franco is still dead.” At the time, this was a take-down of TV news programs trying desperately to find something newsworthy on a slow night, because, of course, a dead person’s continued death is anything but news. Now it looks like these sorts of updates would be a public service. For several years, I have taught a course called “The Unquiet Dead: Imagining the Afterlife in Fiction and Film” In most of the stories about vampires, ghosts, zombies, and the various revenants in between, the return of the dead is, at best, a mixed blessing. Afterlives would seem to satisfy multiple desires, from the wish for personal immortality to an end to mourning, not to mention a reader’s hunger for impossible sequels. With afterlives, stories, and life, can go on and on. So I’m inclined to think of Babchenko’s miraculous non-death in terms of narrative. And it is narrative that points to the most likely sources of discomfort. The revelation that someone presumed dead is actually alive is a very old literary trick, old enough to be satisfying and frustrating at the same time. Satisfying, because we want the character to still be alive, but frustrating, because we feel a bit cheated by having allowed ourselves to be taken in and to grieve. if you’re a fan of Game of Thrones, you need only think of two names: Ned Stark and Jon Snow. The Game of Thrones comparison is callous and inappropriate; Arkady Babchenko is real, and Ned Stark is not. But this brings me back to where I started: I don’t know Babchenko. Most of us don’t know Babchenko. We experience our news about strangers by responding to the same tropes that work on us when we read or watch fiction. It’s bad enough that our confidence in news and truth is at an all-time low; when real events start to look like bad soap-opera plot twists (Bobby Ewing isn’t dead—he’s just taking a shower! ), it’s not surprising that our moral compass is challenged by our critical sensibility. And all this on the same day as the series finale of The Americans! Again, most of us have no right to feel anything but happy for Babchenko. We don’t know him, so we have no cause to reproach him. I leave that to his former widow.